In this review we aim to offer information and advice based on the data analysis we performed on Garcinia Cambogia designed by Rightway Nutrition. This product is a weight loss supplement developed to help the user improve the rate at which he or she is losing weight. It works by boosting the user’s energy levels, increasing metabolism and by suppressing food cravings. It is developed to speed up the calorie burning process and to stop new fat cells from attaching themselves to the body. Garcinia Cambogia is sold as a dietary supplement without requiring a prescription, therefore, it can be found in online stores. 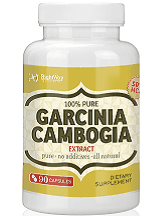 This product is formulated based on the garcinia cambogia extract which is used as the main component for the supplement. The main active ingredient here is the hydroxycitric acid found at a 50% concentration. Clinical studies show that this acid is the reason why consumer’s may benefit from appetite suppression, metabolic rate increase and ultimately a loss of weight. It works by inhibiting the consumer’s need for a high-calorie diet and it stops new fat from being deposited. The only direction found on the product’s label is that the serving size consists of three capsules. There are no instructions to specify as to how often to take the capsules, when and how many servings could be administered per day as a maximum dosage. The product is listed with the price of $19.90 per bottle containing 90 capsules. The supplement does not come with any special discounts or coupons. Customers do not have the option of creating an auto-renewing subscription plan either and there will be no benefits from ordering more than just one container. The manufacturing company assures the consumer base that the product is entirely safe and free of any side effects. The supplement does not contain any artificial ingredients that could negatively interact with the active ingredient or with other medications or supplements. After taking a look at customer’s feedback, reviews confirm that the product is generally safe as there is a lack of complaints regarding adverse reactions. Rightway Nutrition does not seem to offer any guarantee in the form of a return policy. There is no information that specifies a customer can return any product for a full refund if he or she is not satisfied with the results. Reviews, however, are backing this product for the most part as they rate it 4 out 5 stars on average. Most customers describe a pleasant experience but there is a minority that is completely dissatisfied, claiming that they did not experience any effects. We conclude that Rightway Nutrition’s Garcinia Cambogia is a side effect free natural product that does not contain chemical additives which could endanger consumer’s health. Reviews are backing this product as well as they are mostly positive. There are however a couple of downsides. For example, this supplement does not come with any guarantee from the manufacturer. It is unknown whether customers can receive a refund. There are also no discounts, offers, or monthly subscription plans that could prove advantageous to potential customers.